Maria Eichwald and Filip Barankiewicz in La Sylphide pdd 16.5.2015. Maria Eichwald and Filip Barankiewicz in La Sylphide pdd, music by Herman Severin Lovenskiold, choreography by August Bourneville. 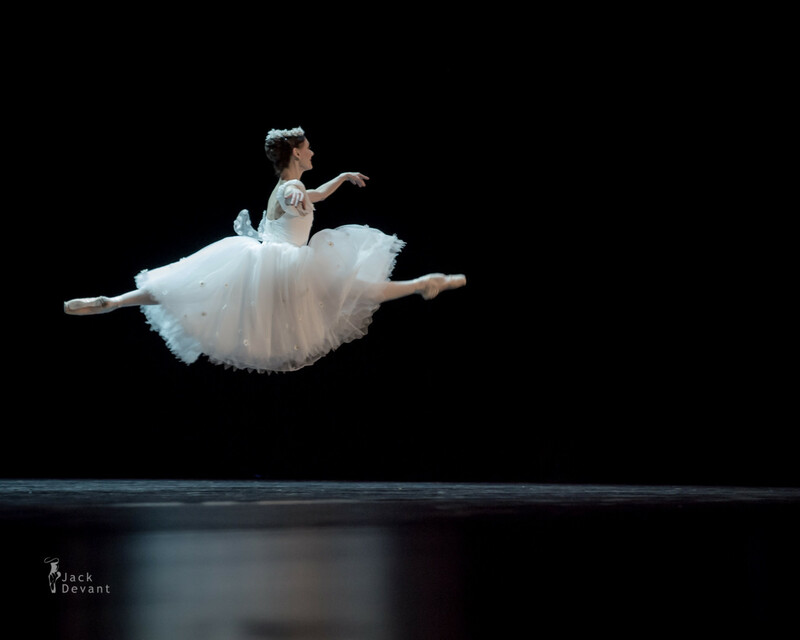 Gala des Etoiles 2015, Juwelen des Welballetts, shot on 15.th and 16th of May 2015 in Grand Théâtre Luxembourg. Shot on 16.5.2015. Maria Eichwald is currently Principal Ballerina with Stuttgart Ballet, Germany. Sge was born at Talgar, Kazakhstan, later settled in Germany. Eichwald trained at the national ballet academy in Alma-Ata, Kazakhstan before becoming a soloist dancer at the national theatre. Due to her German ancestry she moved to Germany in 1995. In 1996 she joined the National Theatre Munich where she became a principal dancer in 1999. In Munich she danced a variety of leading roles. She abruptly left the company to accept an offer from the celebrated Stuttgart Ballet in Stuttgart, Germany. Since then, Eichwald has toured the world with the company. Filip Barankiewicz is currently Principal Dancer with Stuttgart Ballet. He was born in Warsaw, Poland. In 1986, he began his ballet training at the National Ballet School in his home city and performed in various ballets in Warsaw and Lódz. In 1995, he graduated and continued his studies with Marika Besobrasova at the Académie de Dance Classique in Monte Carlo where he received a scholarship sponsored by the Nurejev Foundation and graduated in 1996. Filip joined the Stuttgart Ballet in the same year. He was promoted to Demi Soloist in September 2000, to Soloist in September 2001. His promotion to Principal Dancer followed in September 2002. Filip Barankiewicz also successfully completed his ballet pedagogue education in 2003. Besides dancing Filip Barankiewicz now also works as guest trainer at the Polish National Ballet in Warsaw as well as at the Ballet of the Czech National Theatre Prague. At the Stuttgart Ballet he coaches rehearsals of The Taming of the Shrew (John Cranko) and Giselle (prod. : Reid Anderson, Valentina Savina). In 2014 he will also coach the rehearsals of John Cranko’s Onegin at the Royal Swedish Ballet Stockholm and at the Finnish National Ballet in Helsinki. La Sylphide (English: The Sylph) is a romantic ballet in two acts. There were two versions of the ballet; the original one choreographed by Filippo Taglioni in 1832, and a version choreographed by August Bournonville in 1836. Bournonville’s is the only version known to have survived and thus is one of the world’s oldest surviving ballets.